This was a different launch for Aerojet Rocketdyne, Inc., a subsidiary of Aerojet Rocketdyne Holdings, Inc. (NYSE:AJRD), of the launch of the Space Based Infrared System (SBIRS) Geosynchronous Earth Orbit satellite 4 (GEO Flight-4) aboard a United Launch Alliance (ULA) Atlas V rocket from Cape Canaveral Air Force Station, Florida. The mission differed from previous SBIRS launches aboard the Atlas V rocket in that an Aerojet Rocketdyne AJ-60A solid rocket strap-on motor was used to increase the vehicle’s lifting capability. Additionally, Aerojet Rocketdyne's part in the launch of the U.S. Air Force’s newest missile warning satellite included a role in helping to minimize the mission’s impact on Earth’s orbital environment. The added power from the single AJ-60A reduced the amount of fuel needed by the rocket’s Centaur upper stage to place the Lockheed Martin-built SBIRS GEO Flight-4 satellite into its proper transfer orbit. Once the satellite separated, the Centaur had sufficient fuel left over to propel itself into the ocean, so that it will not pose a collision threat to spacecraft in an increasingly congested orbital environment. Eileen Drake, CEO and president of Aerojet Rocketdyne said as space becomes increasingly congested, it is important to recognize propulsion systems play an important role in supporting efforts to minimize orbital congestion that otherwise could hamper future operations. 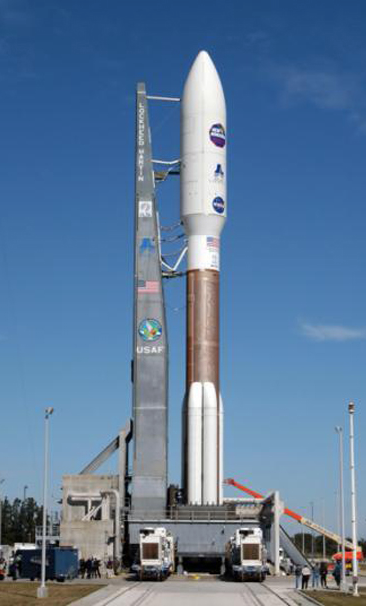 The Centaur is powered by Aerojet Rocketdyne’s RL10C-1 upper-stage engine, which generates 22,890 pounds of thrust. Variants of the RL10 have been in service for more than 50 years on multiple vehicles, including ULA’s current Delta IV, which is used along with the Atlas V to launch the vast majority of U.S. national security satellites. Both stages of the Atlas V used Aerojet Rocketdyne-supplied helium pressurization tanks, while the company’s 12 MR-106 hydrazine thrusters provided roll, pitch and yaw control, as well as settling burns, for the Centaur’s phase of the mission. Aerojet Rocketdyne’s propulsion products were not limited to the launch vehicle. The SBIRS GEO Flight-4 satellite is equipped with 18 Aerojet Rocketdyne hydrazine thrusters that will maintain its orbit and orientation during a mission lasting up to 12 or more years. These include 12 MR-103 thrusters providing .2 pounds of thrust each, and six MR-106L hydrazine thrusters, each providing 5 pounds of thrust. In addition to maintaining the satellite in its orbital position, these thrusters provide attitude control during orbit raising as well as the boost needed to decommission the satellite at the end of its service life. Built by Lockheed Martin Space, SBIRS consists of a network of satellites in geosynchronous orbit, sensors in highly elliptical orbit and a sophisticated ground control system. The SBIRS’ primary mission is to provide timely warning of missile launches throughout the world. Other SBIRS missions include missile defense, battlespace awareness and technical intelligence gathering. Once it completes on-orbiting testing, GEO Flight-4 will round out the initial SBIRS constellation, providing global coverage. Drake added that the SBIRS satellites help safeguard the nation’s homeland and deployed forces against the threat of ballistic missile attacks. It is critical to have reliable propulsion systems on every satellite to ensure they maintain a watchful eye and are able to detect a threat at a moment’s notice.